Where: Lucky Dog Books, 633 W. Davis St.
WordSpace is proud to offer a master class with Mitchell S. Jackson on Feb. 7th in conjunction with his Dallas performance Feb. 6 @ SDCC. Click here for the show and read on for information on how to submit. We invite you to submit a short story or excerpt of 15 pages, double-space for consideration to be discussed in the workshop. We will pass along the best manuscripts for consideration to Jackson and he will choose which ones to discuss in class. Space is limited. Manuscripts sent in earlier will be given priority for consideration. Follow the link below to submit. Mitchell S. Jackson is a Portland, Oregon native who lives in Brooklyn, New York. 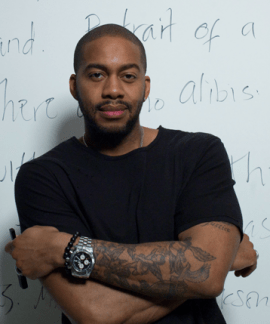 He is a 2014 Lannan Foundation Fellow and winner of the Ernest Gaines prize for fiction and has been the recipient of fellowships from Urban Artist Initiative and The Center For Fiction and the Hurston Wright Foundation’s award. Jackson teaches writing at New York University. His novel The Residue Years was praised by publications such as The New York Times, The Times of London, and O, the Oprah Magazine. The novel was a finalist for the Center For Fiction’s Flaherty-Dunnan First novel prize, the PEN/ Hemingway award for first fiction, The Hurston / Wright Legacy Award for best fiction by a writer of African descent; it was long-listed for the William Saroyan International Prize for writing. We will notify you by Feb. 5th if accepted. Payment will be due immediately.